The tattooing industry has come such a long way over the last 5-10 years and we are lucky to now have many different brow techniques to choose from. But how do you choose which technique is right for you? This is the question I am most frequently asked about eyebrow tattoos. Each technique has its own unique application, benefits and healed outcome. It is important to know the difference between the techniques, understand what look you are after & acknowledge your technicians’ recommendation. Not all techniques may suit your skin type, natural brow hairs or lifestyle. In my own opinion, there is no one method which is superior to another – different methods of application achieve different looks and are suitable for different faces. Well, first let’s explain and show you what the different techniques are, and who they may benefit. Also known as feather touch brows, microblading, hairstroke brows, 3D brows and so on. There are many different names for this technique but they all are the same thing. This style of brows involves a process using a manual hand-tool with a cluster of fine needles, which is used to implant pigment into the skin to create life-like hair strokes. Compared to a tattoo gun this technique is a more delicate process allowing us to create finer strokes to blend in with your hair. Feathering is not the best technique for anyone with oily skin or older ladies with thin skin/fine lines or wrinkles through their eyebrows. The strokes can blur into wrinkles and tend to fade quicker on people with oily skin, they can also heal grey in thin skin. Ombre brows use a traditional tattoo gun which is used to shade in the eyebrows. This technique starts off stronger and more defined when the tattoo is fresh but heals to leave a soft powder finish (looking like you have brushed an eyebrow powder through your brows). Depending on how much colour is implanted into the skin this technique can be as soft or as defined as you like. Our younger clients like the trendy look of Ombre with very soft inner bulbs blending out into a more defined arch and tail. This technique is great for all skin types, especially people with oily skin or dense eyebrow hair. It is great for defining/ reshaping and fills in the brows perfectly. What are HD or Combo Brows? Combo brows are great for people who want to keep the start of their brows looking supernatural but need the definition or fullness through the arch & tail. Still unsure as to which technique would be best for you? Ask yourself why you want your brows tattooed? Do you wear makeup everyday & sick of penciling your brows? You don’t have many natural hairs & you have never filled them in before? Let’s not scare you! You might be best to start with feathering, so you can get used to the shape & actually having eyebrows on your face. Remember its always easier to add more later on. You overplucked in the 90’s and you want to thicken your shape? In this case we see a lot of clients that have super thin brows but have dark / a lot of hair in the shape that’s there. If this is you, Combo brows are probably your best choice. Sometimes when thickening up a shape with feathering alone the tattooed hair strokes don’t blend into your natural shape very well. It’s not a flattering look when you can see the difference between your natural hair and the tattooed hair. 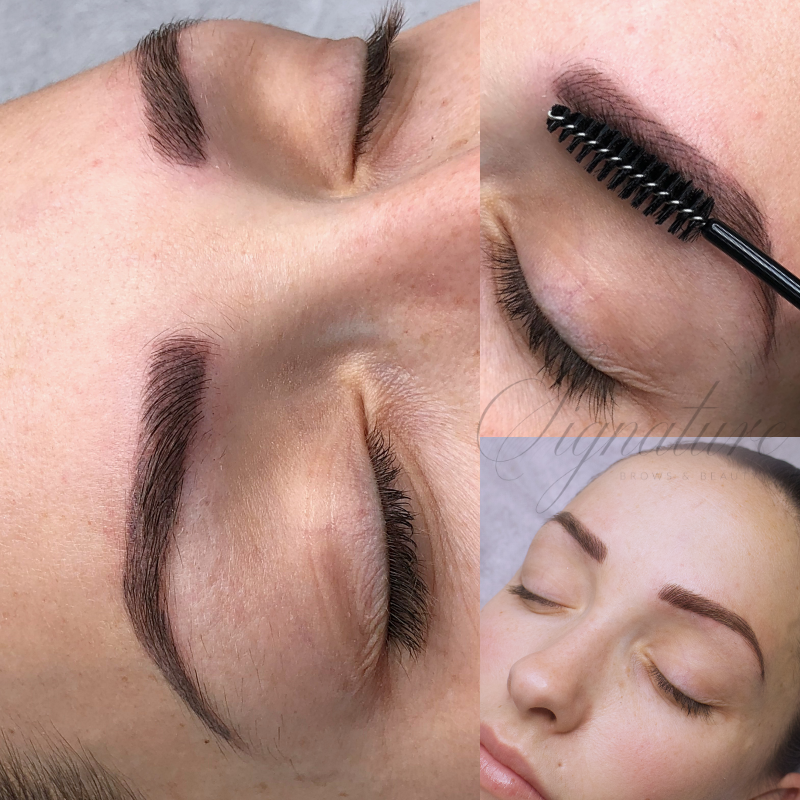 With combo brows we can add a soft shading throughout your strokes to fill in and give your shape a background colour. This stops your brows from looking gappy between the strokes. you are best to stay away from feather (hair stoke brows) They may look great to start off with but when your strokes heal up, in these cases you will most likely end up with either blurred/patchy strokes, grey coloured strokes, or the strokes just won’t hold well at all. Cosmetic tattooing can be an expensive treatment, so you want to make sure you pick the right technique that you are going to be happy with. Choose a technician that can offer you different techniques & styles because as you have learnt not one technique is right for everyone. And if you still can’t decide on which you like best remember it is always easier to add more than take away. So, start with something more natural because you can always come back and build on what you have there. I have a lot of clients who will start with feathering or combo and then at their 6 week touch up, or even 6 months later come back and darken, thicken or add some more shading through. Talk to your technician, explain what look & style you are after, let them assess your skin and brows and between the both of you the right technique will be decided. If you are interested in getting your Eyebrows done on the Sunshine Coast Book your appointment now!